Home > Featured > Drones to aid ski area operations? Drones to aid ski area operations? Ski areas need to have a drone policy and offer a culture of friendliness and helpfulness to ensure their futures. These were just two of the important takeaways from the National Ski Areas Association (NSAA) Eastern Winter Conference and Trade Show hosted at Killington Resort last week. The conference brought together ski area operators, owners, and staff for two-days of sessions on a multitude of topics, ranging from best practices to the latest industry concerns and issues. A session entitled “How Drone Technology Will Change Resort Operations” was packed. Drones are unmanned aerial vehicles (UAVs), which are highly maneuverable remote-controlled aircraft (also known as Multicopters). They are lightweight, battery powered, quiet, and fly like a helicopter with six or eight electric motors. They are either remotely controlled with a tablet device by someone trained to operate them or put on autopilot and receive signals from a subject wearing a transmitter. Lately there have been many news reports about drone. From predator drones, to Amazon’s proposal to deliver packages by aerial drones to the public and legislative debates about surveillance or law enforcement uses of drones. Drones are already being used for recreational and commercial purposes, from locating missing hikers to creating beautiful, cost-effective aerial cinematography. Presenter Jim Blanchard, chief scientist at UAS Academy, told an attentive audience that drones are the wave of the future at ski areas. Drone technology will be an affordable tool with many applications impacting all aspects of resort operations, not just marketing, Blanchard said. An UAV expert who is helping to write rules for drone use in the ski industry — FAA regulations have not been formulated yet — Blanchard discussed the technological promise of drones, including thermal heat imaging, gauging snow depths, infrastructure inspections, mapping, delivery systems, locating missing or lost skiers, and even as aerial avalanche transceivers. There is the potential to aid in preventative maintenance and to reduce operating costs and increase profits as well, he said. He reviewed training and certification issues, including that the FAA will require a pilot’s license to operate a commercial drone. A paid ski area employee flying a drone is a commercial use and someone hired to film a wedding at a resort is also a commercial use. The FAA is encouraging drone use at ski areas and is developing a template for such use, Blanchard added. He said a resort will be able to do a Section 333 application within a few months if they get a legal team and drone experts together; costs could run from $20,000 to $50,000 with training and manual included. Allowing recreational drone users who fly drones for fun to do so at resorts presents potential liability issues. Currently risk management considerations for resorts include such things as safety, privacy, insurance and liability issues. These issues are at the heart of an urgent need for areas to draw up drone policies regarding guest use, Blanchard noted. A few in the audience said they already had ‘no fly’ policies at their resorts. Blanchard said that drone impact to the industry will be analogous to that of snowboards. “Areas that get behind the power curve of drone technology will be at a disadvantage just as those who were late to embrace snowboarding were,” he told The Mountain Times. 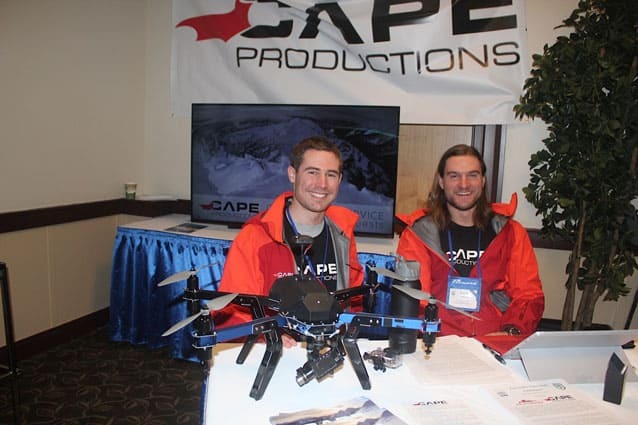 Cape Productions out of California flies drones to film skiers and snowboarders in Canada and the U.S. They had a video running to show the appeal of this new use for resort guests. It was amazing footage and easy to see how skiers and riders would desire this service, which Cape makes available. (They send edited film links to a guest’s phone or device.) Jason Soll, co-founder of Cape Productions, said aerial filming is a natural next step to the Go Pro cameras which so many skiers and snowboarders sport today. On Wednesday morning, Cape Productions demonstrated their on-demand video service by giving participants an electronic bracelet to wear for a run. A programmed drone flying on autopilot filmed the participant and video links were shared for afterward. Several other sessions presented information on how NSAA is helping ski areas to grow the industry. One session “Conversion Best Practices,” focused on 10 strategies from successful areas that have increased the retention and conversion of first-time skiers and riders. At another session, presenter Nate Fristoe, managing director of RRC Associates, which tracks the ski industry, explained how data being collected in a Beginner Conversion Dashboard will benefit ski areas by showing what works, what doesn’t work, and why efforts are effective. A cooperative initiative between NSAA and RRC, the dashboard will provide benchmarks for conversion, frequency, migration patterns, and feedback from real first-time skiers and riders, he said. In the session “Who Owns the First Timer?” panel members shared their respective experiences with successful programs that not only aim to attract newcomers to snowsports but most importantly to convert them to lifelong participants in skiing or snowboarding. Tyler Fairbank, CEO of The Fairbank Group which owns Jiminy Peak, Bromley, and Cranmore; Dave Beckwith, Killington’s Director of Golf and Snowsports; Tony Keller, Camelback’s Snowsports School Director’ and Rob Bevier, Loon’s Snowsports Director stressed that a culture of friendliness and helpfulness is mandatory. All staff who come in contact with guests are critical to first timers having a good experience and to the growth of the sport, Keller stressed, noting how efforts must extend far beyond the slopes and start in the parking, arrival, and ticket and rental areas. Beckwith added this extends to workers behind the scenes, noting co-operation from snowmakers and groomers is important to creating the learning terrain used by the snowsports school. Beckwith shared that instructors are being hired for their people skills not just their ski/snowboard expertise. He said more time is taken at interviews that start in summer to hire the right people. He noted newer instructors who are “green” but have a way with people are being given private lesson assignments now and that it is working well for beginners. He also reported that Killington’s Discovery program worked well in its first year and that the free Killington branded Elan skis given to participants have been spotted as far away as California. Fairbank noted that a similar six-pack kids program is seeing “off the charts” results this year at Bromley. The other areas reported some similar first-timer enticement programs or packages. Asked about their profitability, Keller said that Camelback had seen huge increases in lessons via their three-day package of lifts, lesson, and rentals for $129. It more than doubled lessons given and was so popular that Camelback offered learn-to packages for the first time ever for this past Thanksgiving and did 600 beginner lessons over three days. There was also agreement that it is still too soon to tell how such programs, which are an investment in the future of snowsports, will affect bottom lines because they have to track the results on a more long-term basis to truly know. Killington and Pico’s Director of Sales and Marketing Rob Megnin, who has been at the forefront of retention strategies, told the Mountain Times that the “several [NSAA] programs dedicated to conversion and retention” are crucial to the industry. “TBL (Terrain Based Learning) is gaining more industry traction and focus,” he added. NSAA is a trade association representing 325 alpine resorts that account for over 90 percent of the skier/snowboarder visits nationwide. Additionally, it has 472 supplier members who provide equipment, goods and services to the mountain resort industry.